But let's get real...marketing is far more than just lead generation. Talking to your potential customer in a way that resonates with them. Building a relationship with your ideal audience. Helping interested people become paying clients and customers. Putting systems in place so you can focus elsewhere. Measuring and understanding the results of your efforts. We have found that most small and medium sized business do not have a complete marketing plan. We help companies like these take a helicopter view of what they are doing. We look at what is and isn't working for them. We help businesses get solutions in place for their specific challenges. Whether you need help with getting more client opportunities, client retention, or converting tire kickers into paying customers, we have a solution. Want to Continue the Conversation? Connect with me Here! Or call Align Local to start the discussion. 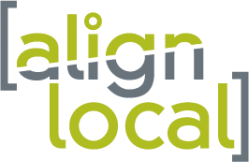 Align Local is a marketing and adverting agency. We give our clients an overview of their marketing. We help them see what's working and what is not working so they can become more profitable. If you don't have a marketing program in place, we help you understand exactly what that means for your business. We can help you get marketing in place that suits your needs and solves your problems. We are located in Livingston County and serve surrounding cities including Howell, Fowlerville, Hartland, Pinckney, Whitmore Lake, and Brighton Michigan. We are also proud members of the Greater Brighton Chamber of Commerce. We love helping fellow local companies but of course, we don't stop there! We have helped companies throughout the US and even in Australia. ​Even if you're not local, I invite you to connect with me professionally on LinkedIn.